Procedures are scheduled depending on the anticipated potential for therapeutic intervention. Palliative laser treatments are most often indicated in patients with malignant obstructing airway disease. Endoscopic laser treatment in these patients should be reserved for poor surgical candidates or those with inoperable disease. Surgery remains the only curative option. A patient who refuses surgery should not be considered a candidate for laser resection unless he or she has understood the risks inherent to refusing a potentially life-saving procedure. Endoscopic treatment is occasionally indicated prior to surgery as a means of improving the patient’s general state of health by relieving post-obstructive pneumonia, or in order to document the true endobronchial extent of a given tumor. Laser resection may also down-stage a tumor by making lobectomy possible in selected patients scheduled for pneumonectomy. 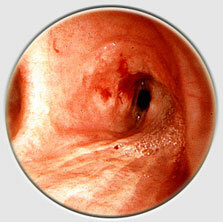 One of the singular advantages of therapeutic endoscopy is its vast potential. In fact, any patient presenting with airway obstruction can be a potential candidate for endoscopic resection. In general, it is difficult to speak of specific indications. No pathologic diagnosis is a contraindication for endoscopic resection. Whether a tumor is benign or malignant, primary or metastatic, laser resection is always an option. In our experience, this is true of all tumors, including those which are exceptionally rare. Some endoscopists believe that potentially hemorrhagic tumors such as carcinoids represent relative contraindications to laser resection, but in our view, adequate technique and instrumentation render such resections entirely feasible. In fact, it should be said that the astute endoscopist will approach all tumors with caution, regardless of histology, as they may all be potentially hemorrhagic. It would seem that the airway wall is the only absolute limit to endoscopic resection. Only endoluminal tumors should be resected. This does not mean that patients with extrinsic compression of the airway cannot be treated endoscopically. In fact, such patients may be ideal candidates for tracheal dilatation followed by stent placement, e.g., patients with esophageal tumors compressing the trachea. If laser resection of anaplastic or poorly differentiated tumors is unsuccessful, it is often due to the presence of abundant disease extrinsic to the airway rather than tumor biology. On the other hand, just because a tumor is primarily extrinsic to the airway, doesn’t preclude laser resection from providing successful palliation in the treatment of endobronchial disease. A tumor must be accessible in order for resection to be feasible. In our experience, while the histologic subtype is of no consequence, the location of the tumor is critically important for a successful resection. We have observed a direct correlation between the distance of the lesions from the central airways and the outcome of laser resection. 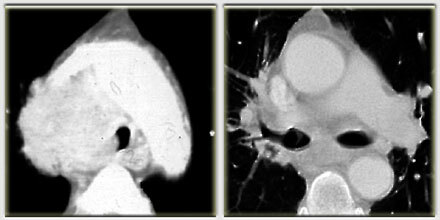 Tumors located in the trachea can generally be resected in one session. This is also true of tumors originating from the proximal main stem bronchi. 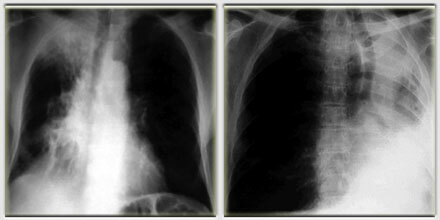 Left main stem tumors are challenging for two reasons ; the oblique angle of take off inherent to this bronchus, and the presence of abundant vascular structures in its vicinity. 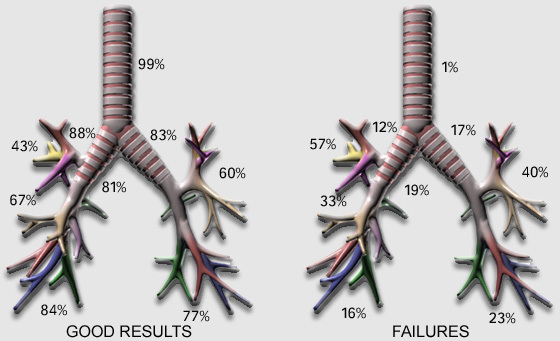 Poorer outcomes are to be expected when treating lesions in segmental bronchi, partly because of difficult access, but also due to the loss of precise anatomical landmarks. It is unlikely that a peripheral resection will be complete in a single session. 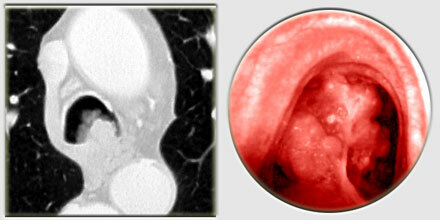 Tumors in the upper lobe bronchi are especially challenging. In both cases, the fiberoptic bronchoscope must be used, thus limiting the probabilities of a successful resection. Furthermore, the proximity of the pulmonary artery to the left upper lobe bronchus makes resection of lesions in this location quite dangerous. The chronicity of a given lesion is also an important concern in laser resection. In our experience, chronic malignant obstruction of the airway is difficult to treat due to extensive extrabronchial spread. In addition, the patients functional status is often quite deteriorated by the time they undergo resection. Even though all histologic sub-types are amenable to successful laser resection, some recur faster than others. Following endoscopic treatment, squamous cell carcinomas can be expected to recur within 2 to 4 months, while patients with localized cylindromas will not generally relapse for at least 6 months. Tumors with fusiform cells recur rapidly, often within two months of treatment. Carcinoid tumors tend to regrow very slowly, and sometimes may never recur following laser resection. The time to relapse depends as well on the extent of extraluminal disease. The carcinoid shown here has been completely resected and follow-up at 2 months and 2 years shows no evidence of recurrence as confirmed by CT scan and biopsy. Laser effects are not cumulative. This makes multiple treatments possible. 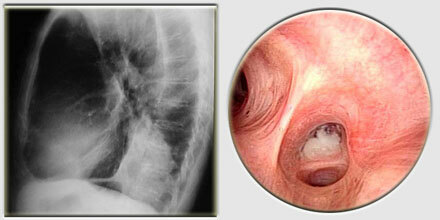 The patient presented here has undergone 15 resections in three years. That notwithstanding, since the goal of laser treatment is palliative, one must strive to achieve as complete a resection as possible in one session. A redo procedure should only be contemplated as a means to treat recurrent symptoms. We do not advocate systematic endoscopic follow-up as we find this does not prolong survival and imposes undue stress on the patient. 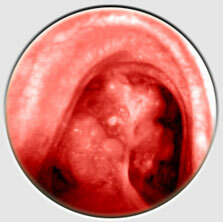 Endoscopic treatment should be viewed as complementary to conventional therapeutic alternatives. For many of our patients, laser resection is seen as a last ditch effort to treat a tumor which has failed to respond to chemotherapy or radiation therapy. recognized by the general medical community, more patients are being referred for palliative laser resection early. We advocate early referral for laser resection, because patients with a post-obstructive syndrome are less likely to respond. The patient presented here had a squamous cell lung cancer astride the main carina. Following sub-total resection of his endobronchial lesions, he underwent two cycles of chemotherapy. At two months, there was no evidence of recurrence. CT scan and biopsies two years post-resection have been negative. It is difficult to discuss long term survival using objective criteria following endoscopic resection. Patient outcomes depend on a variety of factors including tumor extension and the functional status of the patient at the time of resection. Furthermore, successful resection is almost always accompanied by some other form of conventional therapy. Either chemotherapy or radiation therapy post-resection can have an unpredictable impact on individual outcomes. It is possible however, to expect that an occasional patient might respond surprisingly to laser treatment. In fact, long term survival following palliative laser treatment is not unheard of. In our experience, a number of patients with squamous cell carcinoma affecting the carina who had exhausted conventional treatment options have survived as long as three years post-procedure.